Long before the wonderful Alan Davidson died, I embarked, together with Helen Saberi and Esteban Pombo Villar, on the most marvellous adventure under Alan’s aegis, trying to elucidate the mysteries of natef, a white soft meringue-like dip made with an unlikely ingredient (dessicated roots that look like dead wood) which is served with karabij Halab (semolina cookies filled with either pistachios in Lebanon or walnuts in Aleppo). 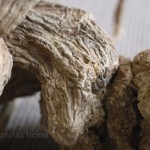 I was writing Lebanese Cuisine then and I had brought some of the root with me from Beirut to test the recipe but I had two conflicting bits of information regarding the root which is known as shirsh el-halaweh in Arabic. Some people refer to it as ‘erq al-halaweh. Claudia Roden describes it as bois de Panama in her Middle Eastern cookbook and the late Ibrahim Mouzannar, one of my favourite authors on Lebanese food, has it as soapwort in his Lebanese cookbook. You can actually read the full investigation of our Interspi (spi for spices) in the Wilder Shores of Gastronomy or in PPC. I will not repeat the information here but I will show you in pictures how natef is made, just in case you can get some and want to experiment. I, for one, am hoping that Australian customs will let me bring in my 1 ½ kilograms of shirsh el-halaweh for my demonstration of natef & karabij during the World Chef Showcase programme in Sydney on 10 October. So, here goes. You start with the very unpromising roots of Saponaria officinalis which have saponin — in fact, the same roots are also used to wash carpets — which you need to rinse well to get rid of the last bits of earth clinging to them. 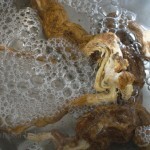 Then you put these to boil in water (exact recipe below) until the water is reduced by three quarters. 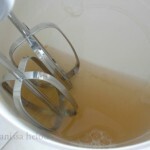 As the water reduces, it changes colour and becomes brown. Looking at it, you would never believe it will eventually turn into the most brilliant white foam. But it does! After you have whisked the water into a white foam, you start adding, slowly, a slightly thicker sugar syrup than normal (sorry, I missed photographing this step; was too busy concentrating on incorporating the syrup and hoping not to mess up). 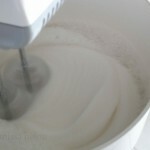 As you add the syrup, the white foam expands to more than double its volume and becomes glossy. I think this is where I have still to master the dip completely. When I asked the lovely owners at Amal Bohsali (my favourite sweet-maker in Beirut) how they made their natef, they gave me a recipe where the syrup is made with glucose, which Mr Ghazi, the father, said makes the dip firmer. I have not yet tried it with glucose but my friend Victoria at Bois de Jasmin will and I or she will report back in due course on her natef. For now, I have only used sugar in the syrup and my natef separates the next day, with the foam staying on top and most of the syrup settling on the bottom whereas the commercially made one stays as it is for a few days. Still, the recipe as it stands works very well (as you can see from the picture) as long as you serve it on the day you make it. As for the karabij, I will post a recipe and pictures in the next few days. Rinse the soapwort under cold water to clean it from the earth that is still clinging to it. Put in a pan together with the water. Place over a medium heat and bring to a boil. Watch the soapwort as it comes to the boil as it will foam up and may boil over. Simmer until the liquid is reduced by three quarters. 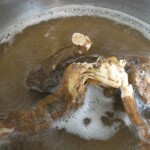 You should be left with 150 ml of the water, which by then will have become brown. While the soapwort is simmering, prepare the syrup. Put the water, sugar and lemon juice in a pan and bring to a boil over a medium heat, stirring occasionally. Let boil for 3 minutes then add the fragrant waters. Mix well. Take off the heat. 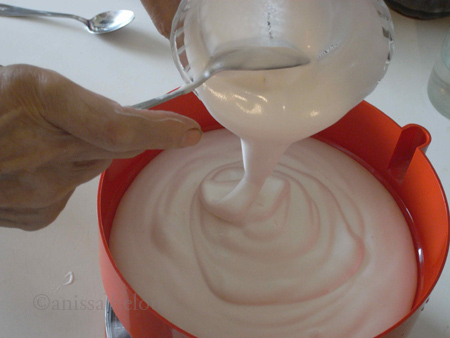 Strain the soapwort liquid into a large mixing bowl and, using an electric beater, whisk until the water has become a white, rather shiny foam – rather unbelievable but true. The miraculous transformation is due to the saponin in the soapwort. 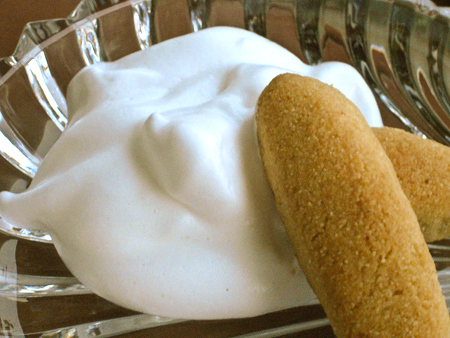 Gradually add the sugar syrup to the foam as the beater is still whisking until you have used it all up and you have a fluffy, stretchy dip/sauce – you can use a little less syrup if you want your dip less sweet. Thank you i appreciate the effort you are putting???? I just tried doing the natif recipe. and having culinary as minor background in my profession, i do consider my self good working in the kitchen. with all due respect, i would like to comment. firstly, it did not work. then the instructions are not so clear. for instance do i whisk on high or low speed. how long do i whisk for? whats the transformation process of the foam into the dip? then making sugar syrup is normally see through. the one you have in your picture is white? how did you manage that? i am very sad to say it was a failed attempt for me! hopefully you can post more clear recipes in the future! I made the natef recipe in your cookbook but the results were really bitter! It looked gorgeous but was inedible, sadly. I followed the recipe very closely. Can you imagine what I may have done wrong? Is the natef used with tahini to make halva? Do you know what the proportions would be? I followed your recipe twice and, after few days it separate, the syrup go to the bottom. I remember my mother used to do it with egg whites. could you tell me why it does that? I tried your recipe but it failed. My mom use to add egg whites after beating ,then add to the Natef foam ,then the suger syrup only.I think thos is the right way to do it. Egg whites are just a substitute for the root ? Egg whites are just a substitute for the root ? and you should beat long enough to achieve the best result. 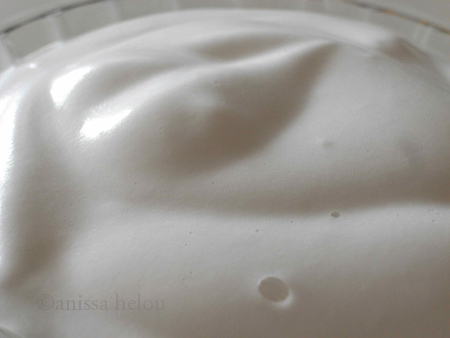 It’s like making italian meringue but the natef has more elasticity due to using the roots. This is great!! works like a charm, thanks so much for this, I’ve been trying to make halva for weeks! !, i still have to learn how to mix it with the tahini, it seems to be very tricky, I guess it’s a temperature thing,I use the powder Saponaria, one tablespoon in 1/3 cup of water,if someone has some tips on how to mix it with tahini I would appreciate it!! thanks again. 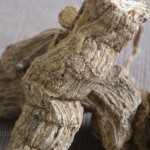 So it is not this the halawa root? I would like to thank you for your thorough explanation of the Natef. I haven’t tried it yet but I will. I have been looking for that recipe for a long time as it reminds me of my childhood and my grandmother from Aleppo Syria, God bless her soul, who used to prepare it for us and it was the most delicious karabij that I have ever tasted. Born in Aleppo, and a serious foodie, mostly of Syrian food, I would like to comment that Karabij Halab are filled with pistachios and topped with natef, maamool with walnuts, sprikled with confectioners sugar.